It was only last February when I had to kill off an ailing hard disk. Well, it seems that my HP laptop's hard disk (bought in Mar 2010) has decided to announce its retirement. I was in for a shocker when I got a hard disk failure warning at boot up when I was 30,000 ft in the air over to Shanghai. I have had these strange encounters of my hard disks dying in mid air. Past experiences was that the moment I am back on the ground, the hard disks worked fine again. Cabin pressure at work here? Anyway, it appeared that I wasn't so lucky this time and I couldn't boot up the laptop even after I landed. I do my weekly backups every Monday but it just so happened that I was flying on Monday itself and I thought heck lah, come back then back up. Lo and behold, it died that very day. Murphy's Law much? The bad news was that I lose up to two weeks' worth of new data. The good news was that I still had the backup albeit not very current. A small consolation considering that fact that the loss was limited to just 2 weeks. I brought it to the shop and had the errant hard disk hooked up to their PC. As it turned out, the hard disk was still readable, just not bootable which is good news. So I paid RMB 350 (SGD 70) for a 500 GB hard disk and got the computer guys to clone the old disk for me. All was good and cherry by the afternoon as I proceeded to end this episode by terminating the life of the old hard disk. 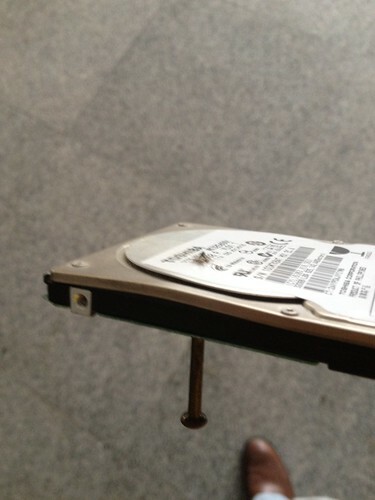 Jay "Hard Disk Vampire Slayer" Walk drove the nail right into the platens, shattering them to bits and pieces.